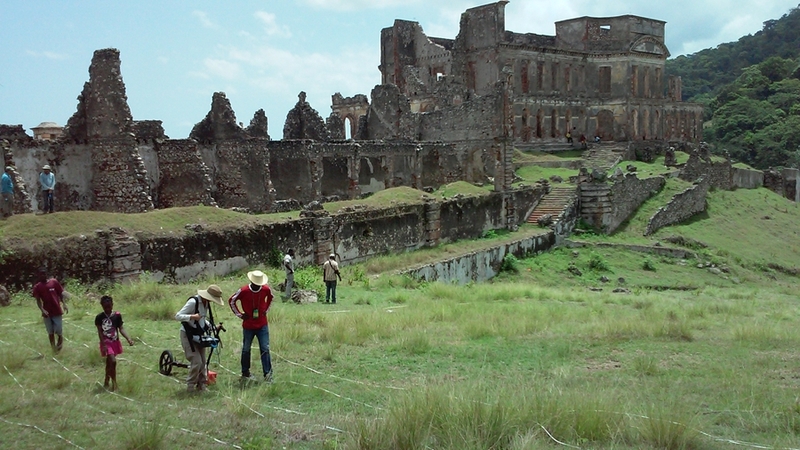 Katie Simon and Mark Joseph carry out survey at UNESCO World Heritage Site, Sans Souci, Haiti, in collaboration with Cameron Monroe and the Milot Archaeological Project. Building on five years of continuous investment, the National Science Foundation has renewed funding for the Spatial Archaeometry Research Collaborations program, an initiative through the University of Arkansas, Dartmouth College and the University of Glasgow that acts as a national hub for geospatial research in archaeology. The $188,545 grant supports the SPARC program, which provides research and technical expertise to archaeological research projects working with a variety of technologies, including 3-D survey and modeling, geospatial analysis and visualization, and geophysical and airborne remote-sensing. As a result of successful collaborative research projects funded during the 2017-2018 SPARC Awards, researchers and collaborators from the SPARC team published two journal articales highlighting innovative spatial archaeometric work in Geosciences and the Journal of Field Archaeology. The SPARC team also began an initiative to make completed project data more accessible via publication on Zenodo, an effort that will continue in the coming year. Looking to future work, SPARC is collaborating with the MicroCT Imaging Consortium for Research and Outreach (MICRO) at the University of Arkansas to support projects undertaking high resolution imaging of objects and samples, growing the program's capacity to support data and analytics projects. The SPARC program was initially created by the Center for Advanced Spatial Technologies and the Archaeo-Imaging Laboratory with a $250,000 grant from the NSF in 2013. The program offers direct support to archaeological projects through awards in fieldwork, data and analytics, and publication. In addition to collaborating on research projects directly, SPARC helps researchers learn about the latest technologies and their archaeological applications through residencies at the Center for Advanced Spatial Technologies or through online resources and periodic webinars. For many decades, space has been viewed as one of the central dimensions of archaeological study, from artifacts to landscapes, and SPARC supports a wide variety of collaborators and projects around the world. Researchers at the Center for Advanced Spatial Technologies have collaborated on 29 projects worldwide, including working with Michael Harrower to conduct geophysical survey in Oman, with Steve Wernke and Parker VanValkenburgh to develop the GeoPACHA platform (Geospatial Platform for Andean Colonial History and Archaeology), and Andrea Brock to model the ancient topography of the Roman Forum Boarium . A full list and complete descriptions of recent awards can be found on the SPARC website. Dolan, Patrick, Colin Grier, Christine Markussen, and Katie Simon. "Magnetic Gradient Survey of the Marpole Period Dionisio Point (DgRv-003) Plankhouse Village, Northwest Coast of North America." Journal of Field Archaeology 42, no. 5 (2017): 437-449. Erb-Satullo, Nathaniel, Dimitri Jachvliani, Tuna Kaylaci, Marina Puturidze, Katie Simon. "The Structure and Growth of Fortress Complexes in the South Caucasus, c. 1500-500 BC." Antiquity. In press. Wiig, Frances, Michael Harrower, Alexander Braun, Smiti Nathan, Joseph Lehner, Katie Simon, Jennie Sturm et al. "Mapping a Subsurface Water Channel with X-Band and C-Band Synthetic Aperture Radar at the Iron Age Archaeological Site of 'Uqdat al-Bakrah (Safah), Oman." Geosciences 8, no. 9 (2018): 334.